Enabling teams to make great products. Hi, I'm Michael Toomey. It's nice to meet you. I am an Interactive Producer and Digital Project Manager, located in Los Angeles, CA. I work with artists, designers, videographers, marketers, and programmers to tell stories and create memorable digital experiences. I have experience building and leading interdisciplinary teams made up of members with diverse skills and working styles. It is my belief that truly great digital experiences are built by teams, not individuals. Being an effective interactive producer requires the ability to work with a diverse team and create an environment for success. Artists, programmers, and business types often think, speak, and approach problems differently. As a producer/project manager it is my job to keep the team focused, positive, and productive. This is done through constant communication. It is important to be both a leader and a collaborator. I am comfortable in both these roles and my ability to transition between them. What does an Interactive Producer do? 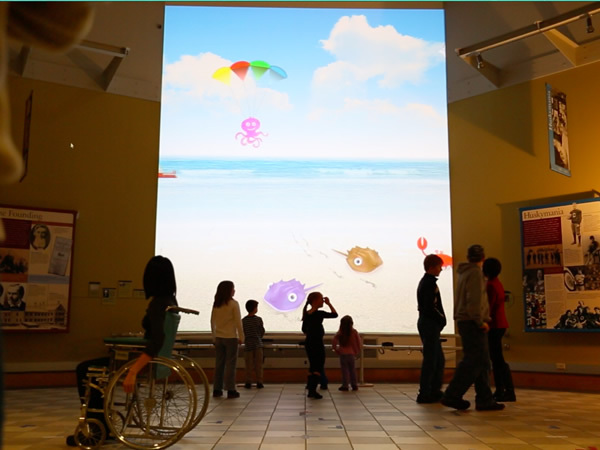 My project management experience includes leading a 15-person team to produce a large-scale interactive media wall. My role included leading and documenting weekly design meetings, bi-weekly product demos, managing and testing hardware installation, and keeping the programming team on track. I acted as the hub between our client, designers, programmers, and technology integration partners. While I had and performed the duties in my job description, my job was really to do whatever needed to be done to move the project to the next level. I approach every project from a user experience standpoint. The prettiest design and most efficient code is wasted if the project does not engage the user and solve a real problem. Whether it's an ecommerce site, an artist's portfolio, or an immersive experience, every project must be built with the end user in mind. My UX workflow includes sketching, user research, developing personas, wireframing, creating flow charts, prototyping, user testing, and iteration. I am currently focusing on improving my UX education and increasing my UX focused project experience, as I believe UX is a very important aspect of product design and will only become more important in the future. I have been developing website front ends since the early 2000's. From the days of Flash (back when it was Macromedia) and Actionscript-driven interactions, to HTML5, CSS3, and jQuery. From table based layouts, to Foundation and Bootstrap. From XML-driven Flash sites to Wordpress as a CMS. From slicing and aligning images in tables, to CSS drop shadows. I enjoy keeping up with the web development trends, for both client and personal projects. I have recently transitioned into a producer/project manager focus, but am able to get into the code when necessary (including coding from scratch) and can speak the front-end language fluently with designers and coders. I have experience producing digital videos, from a nationally televised commercial, to web promos. 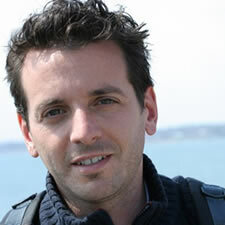 I have been involved in every aspect of video production from preproduction to post and delivery. Whether it be developing the filming and editing process for a 24-camera GoPro time-slice shoot, assisting on commercial shoots, or producing and editing web videos, I enjoy the entire video production process. Build "cool things" and they will come? Those days are gone. Digital Strategy involves building the right things for the right audience, to deliver the right message at the right time, through the right channel. While there is trial and error, it is not "spray and pray." I've worked with authors, artists, and small businesses to help them learn and connect with their audiences in meaningful ways. I have recently begun to focus heavily on the skills and strategy of growth hacking, as I feel this will be a major component of any digital product moving forward. The team required to make meaningful digital products or experiences is a diverse team of designers, programmers, writers, and strategists. Each of these people brings different skills to the table, and each brings his or her own way of thinking, problem solving, and communicating. My approach is to learn the working habits of each of my team members and do everything I can to provide them with the environment to succeed and excel within the team. Every person handles the highs and lows of working on a big project differently, and I try to learn the best way to keep each individual happy, motivated, and productive. I also find that taking the time to learn each member's work and communication style allows me to help members of the team to communicate more effectively with each other. Nationally televised UCONN PSA commercial. Wordpress site server migration and custom template modifications. I am available for hire to work on site in Los Angeles, CA. Willing to travel for exciting projects. Email me at mikeytoomey@gmail.com, or use the form below to contact me. 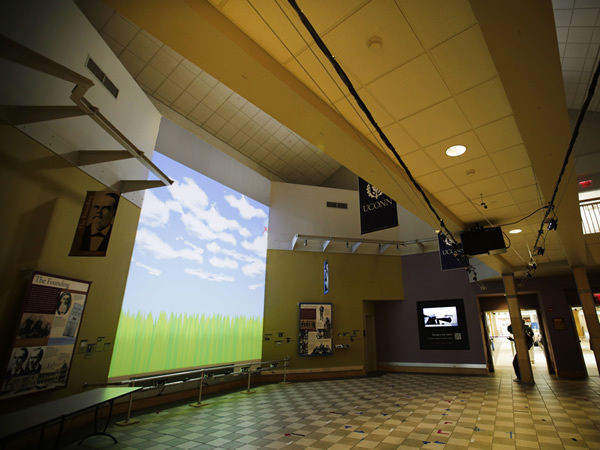 Large-scale immersive digital media experience. Our Solution: We set out to build a two-story interactive display that will react to guests' movements and gestures, as they move through the lobby. The system we built consists of 13 Microsoft Kinect sensors, seven optical cameras, 16 rack-mounted CPUs, and 195 Barco LED panels forming an 18-foot tall interactive display. 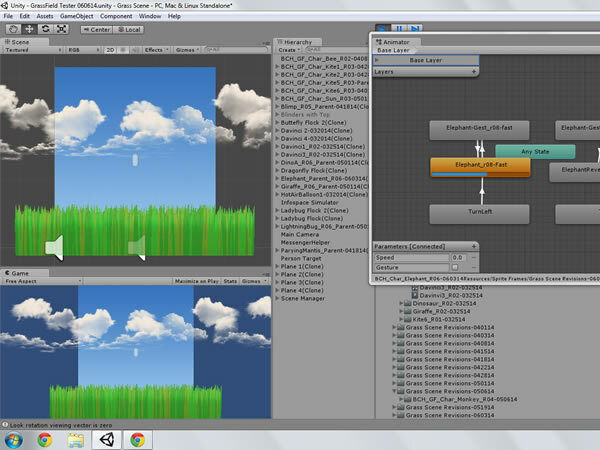 We created several (nine to start) interactive scenes to be run on the wall, as well as the ability to add new scenes remotely. The following is a brief description of the steps we took to develop this huge project from concept to finished product. As the project manager I was deeply involved in every step of the process. Our first step was to define the interactions that our users will be able to have with the media wall. Once our desired interactions were defined, it was time to research possible hardware and software combinations that could be used to build our desired system. 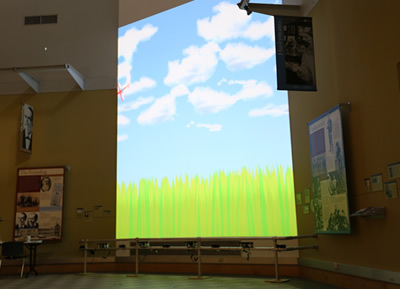 During our research we found that nobody had completed an interactive media wall at a scale this large before. We found a few interactive installations that incorporated two Microsoft Kinects. 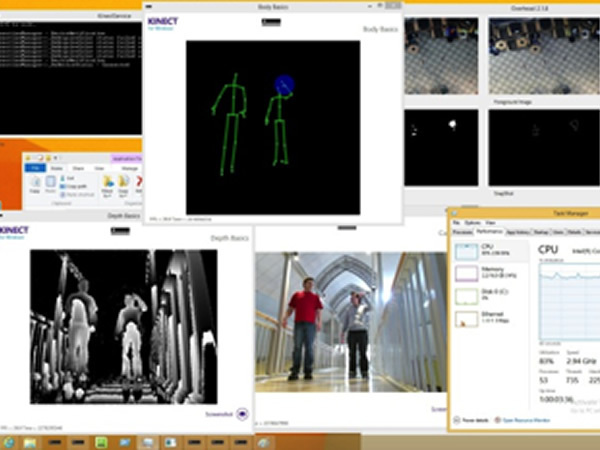 We found some large screen installations that incorporated Kinect interactivity where the user was forced to stand in a certain "hot spot" in order to interact with the system. Our system was to cover an area of 20' by 20' in front of the display and must have seamless interactive coverage for multiple (up to 12 simultaneous) guests. With our broad project goals defined, we created personas for the users that we were building the system for. As the media wall was to be installed in a medical facility for children, we needed to take into account that our system must be able to function with children who may be dealing with physical disabilities. It must also be simple enough for a 4-5 year old child to use, while still engaging to teenagers. This was a very big creative and technical problem for our team. We decided on three interactive scenes to start with and created storyboards to display the creative style of each scene, as well any characters involved in the media, and the interactivity that would be possible. In order to share our desired interactions with the programming team, we created interaction flow charts, interaction tables, character profiles, and animated storyboards. This was the start of a back-and-forth, iterative process that I led between the design team and the programming team. Thirteen Microsoft Kinects + seven optical cameras + 16 rack mounted, networked computers + thousands of feet of cabling + 20,000 lumen projector + MANY hours of programming and testing = working interactive media wall prototype. Now it was time for our programmers to dive into Unity and for our design team to create animated sprites for all of our characters. As the Media Producer of this project as well as PM, I was in charge of integrating all of the artwork into Unity, animating the characters, and applying the interactive scripts that our developers created. As with every other step in our project, this step required a lot of user testing and many iterations. With our system and interactive scenes functioning, we began many cycles of user testing, interviewing, note taking, and artwork and programming iterations. Nationally televised Public Service Announcement featuring time-slice video effects. The Challenge: Our team of students, faculty, and staff at the Digital Media Center was challenged with creating a Public Service Announcement for the University of Connecticut. This PSA would be broadcast nationally during commercial breaks of all televised UCONN sporting events, as well as distributed online. The commercial would need to support the new "Unleashed" branding campaign that had just been put in place at the university. We were challenged with supporting the theme of "Search, Disrupt, Succeed" and position UCONN as an institution on the cutting edge of education. 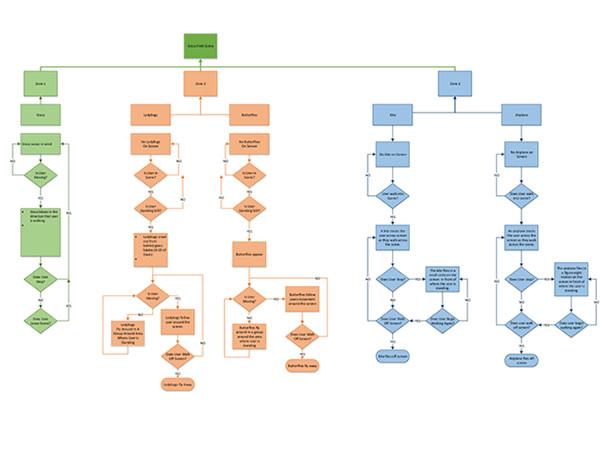 The Process: The process that we followed to produce this commercial can best be described in two phases. The first phase is deciding the "WHAT" and the "WHY" behind our commercial and the second phase is the "HOW" we went about filming and editing it. We needed to find a way to stand out from every other school's PSA. During our research phase, we watched hours of college commercials and found they were all the same. Every school followed a similar template: start with close ups of smiling students, add a professor in a lab coat, some dramatic inspiring music, include overhead shots of a beautiful sprawling campus, and add in a student voiceover talking about how they are building the future. You could take any two commercials, switch the school logos at the end, and nobody would notice the difference. There was nothing to make one school stand out from the others. We needed to find what we could do to make UCONN stand out from the pack. UCONN was undergoing a rebranding and adopting a more aggressive marketing strategy. We decided to produce an aggressively themed PSA. Every aspect of the video was carefully chosen to fit our action-oriented theme. The music was chosen to be aggressive and titles were used instead of voiceover actors. We choose to let the imagery speak for itself. To enhance the action-oriented imagery, we decided to use a time-slice video effect. This incudes using multiple cameras to film your subject from multiple angles simultaneously. 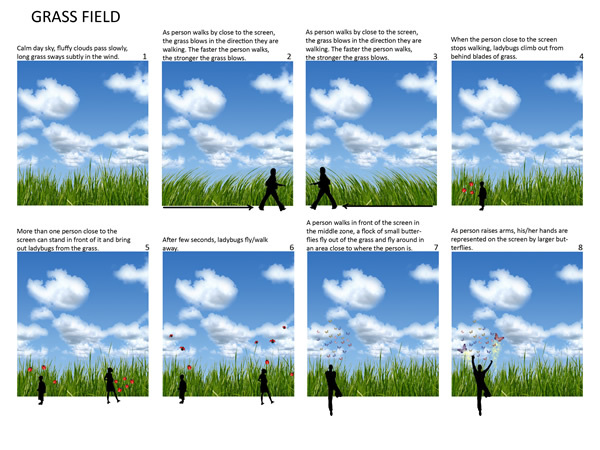 During editing, the multiple angles are used to create the appearance of freezing time. This effect was made popular in the movie "The Matrix." Our goal was to have the commercial "punch you in the face." We wanted it to grab your attention from the first second, before you had a chance to get off the couch and run to the kitchen. We wanted people to remember UCONN as a school that stood out from the rest. Once we decided to feature the time-slice effect in our commercial, we had to figure out how we were going to shoot and edit the footage. After researching time-slice video photography online, we choose to use 25 GoPro cameras, mounted on custom-built multi-camera rigs. I worked with a group of four students to develop the filming and editing process. We spent three weeks developing and perfecting our system. When the time came to film with our actors, we only had an hour to set up, film, and break down for each shot, so we needed to have an optimized routine. Filming simultaneously with 25 cameras increased the post-production process significantly. We also had to develop and efficient process to import, organize, and edit all of the footage. In the end, we had the whole process down to a science, which not only made the commercial possible, but also easy to teach to new students in the future. Wordpress website sever migration and template customization. 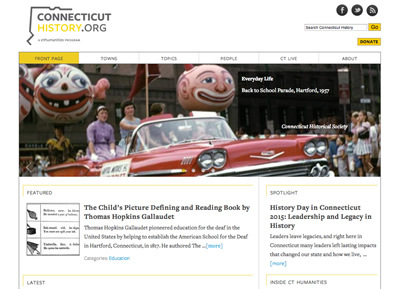 Connecticuthistory.org is a large-scale Wordpress site covering the stories about the people, traditions, innovations, and events making up the history of Connecticut. I was brought onto the project to oversee the site's migration to a new server, and to perform several updates to the site's custom built Wordpress theme. When I was brought onto the project, the site was having trouble with server crashing on a consistent basis. 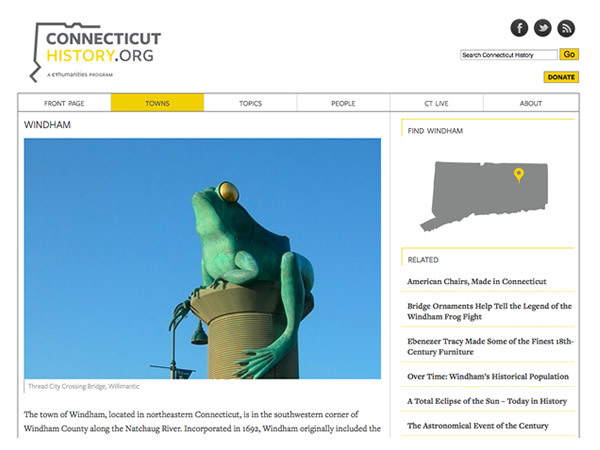 The site was one of several Connecticut Humanities sites that were being attacked and taken down by denial of service attacks. My first task was to prepare the site to be migrated to a new server. We chose to use WPEngine to host the site. I worked with the IT department at the UCONN Library to migrate the site over to WPEngine's server. After the successful server migration, I was next asked to modify the site's custom Wordpress theme. I created a print stylesheet in CSS, hacked several plugins, and created a unique "Featured Article" section that required customized coding. My challenge with the "Featured Article" section was to add the ability for each Category, of which there were hundreds, to have a Featured Article assigned to it. The site's template must also not break if any given Category did not have an assigned Featured Article. To solve this, I created a Custom Field within the Wordpress page and post edit screen, and incorporated that custom field into the template page for the site using php. This addition can be seen on any Town, Person, or Topics landing page within the site.